Now you can install Android Pay and make payments for things in a secured manner. Android pay is digital or e-wallet like Google Wallet; this is developed by Google to do tap-to-pay purchase from your android phone, tablets, or watches. This app uses Near Field Communication (NFC) like in Google Wallet to transmit card information which will facilitate to transfer funds to the retailers. Now users can add credit/debit card information in their android pay wallet. You can add your cards into the app either by taking photograph of card of by entering card information manually. This will allow users to not carry debit/credit card while leaving from home for shopping. 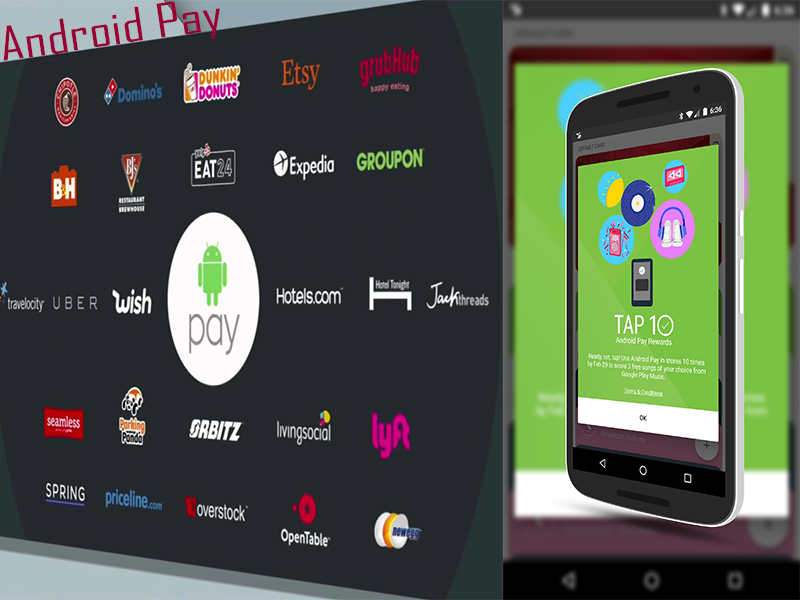 They simply may use android pay app for any kind of transaction. This apps uses security feature like finger print verification if device have feature of finger print Id verification otherwise there is another option for security verification that is Passcode. If users uses android pay app for payment purpose to the merchant then application doesn’t send the cards information to the merchant rather it send virtual account number which represents customer’s account information. Android pay is the successor of Google Wallet released in 2011. As of now Android pay is only available in the countries United States, United Kingdom, Singapore, and Australia. In UK android pay supports MasterCard, and Visa Credit Card, and American Express with debit cards of different financial institutions like – Bank Of Scotland, First Direct, Halifax, HSBC, Lloyds Bank, M&S Bank, MBNA, and Nationwide building society. New banks named RBS and Ulster Bank will be added till September end. Google also added some 19 new rural banks and credit unions across the United States. Including Federal Credit Union (FCU), ACU of Texas, Alpine Credit Union (CU), Alternatives FCU, Bank Of Ozarks, Cambridge Savings Bank, Crane CU, Fairfax Country FCU, First Community Bank, Heritage Federal Credit Union, First Tech FCU, IH Mississippi, First sentry Bank, ORNL, Rainroad & Industrial FCU, Union State Bank Of Fargo, Vally Federal Credit Union, Mill City Credit Union, and Mercantile Bank of Michigan. Recently Google integrate Walgreen’s Balance Rewards loyalty program with Android Pay at 8100 location around the world. Now Walgreens customers will be able to pay with Balance Rewards using Android Pay. Using these facility customers can enjoy savings, earn and redeem loyalty points, and pay their purchases. In coming months Dunkin’s Donuts and Chilis’s both will be integrating their loyalty program in near future. All Android Pay users in US can enjoy 50% off 10 Uber rides. For more details and time to time update you can follow @Android on twitter.